Lou Dim Dim Sum 老點點心竹筒飯 is, by international tourist standards, quite unknown. However, they also sport one of the highest ratings on OpenRice, with 117 thumbs up and 9 thumbs down. That kind of ratio is simply insane. 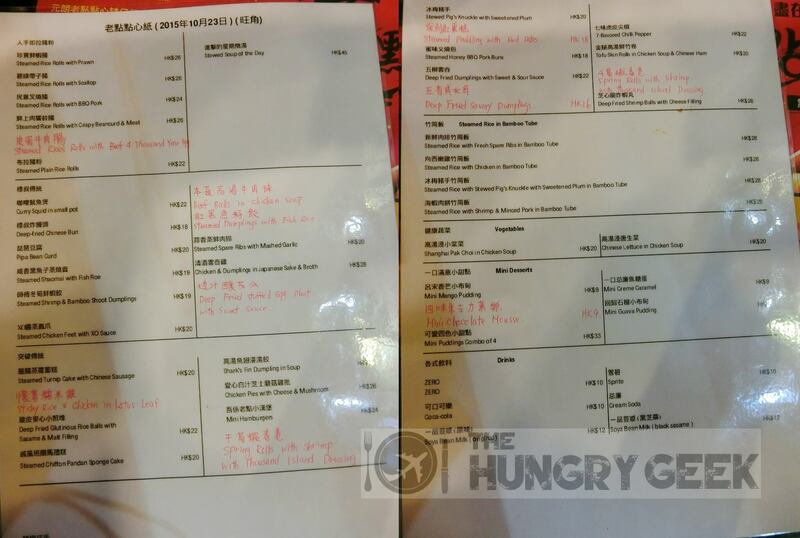 As we did not have any Dim Sum places lined up for our visit to Hong Kong, we decided to slot Lou Dim Dim into our schedule. I think this will probably be the first usage of ‘Lou Dim Dim Sum’, as they are commonly known by their Chinese and Cantonese name 老點點心竹筒飯. 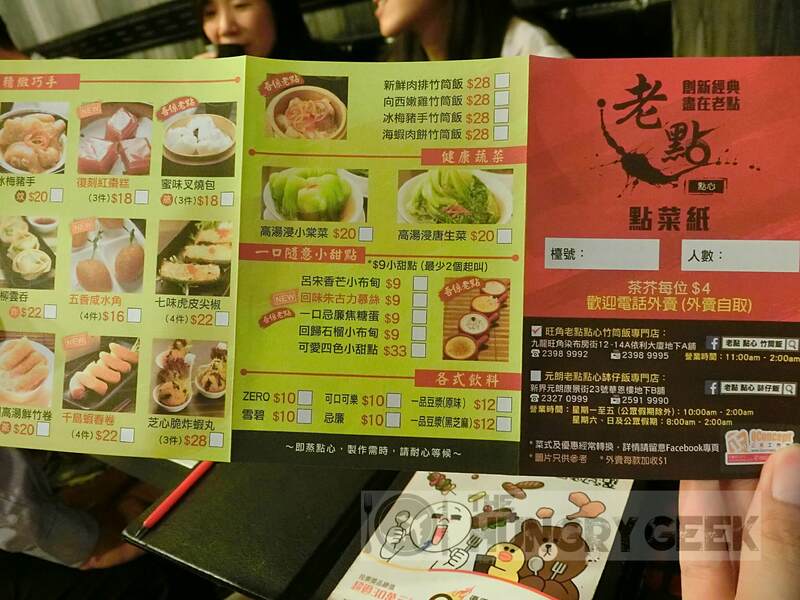 This is a really convenient place to go to for lunch or dinner in you’re in the area visiting the Ladies Market, Langham Place or the other sights around Mongkok (or Mong Kok). The service was great! We were a bit muddle-headed when we arrived and we didn’t realize that we were supposed to indicate our order with a pencil on their nice coloured paper. However their staff patiently took our order. It was our fourth day in Hong Kong and we were getting a bit numb to the service standards but the service at Lou Dim Dim Sum 老點點心竹筒飯 was pleasantly surprising. 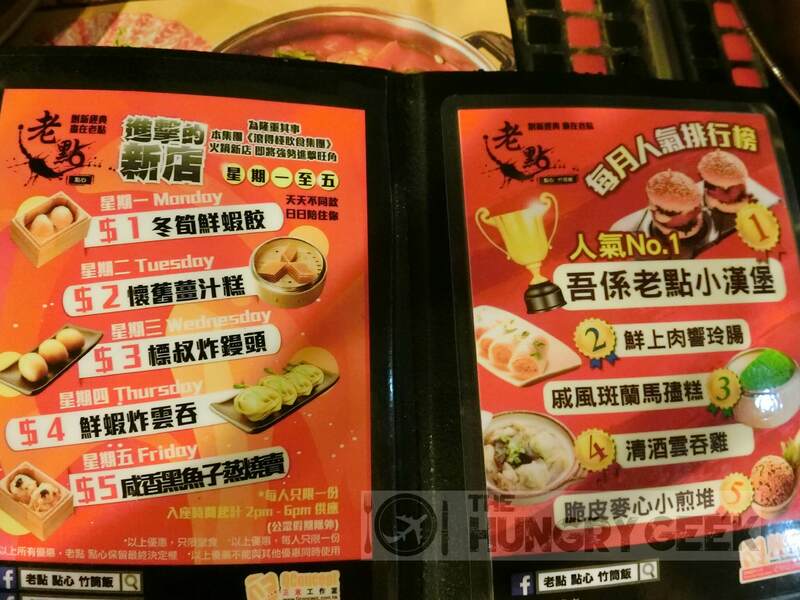 Ordering from the menu is pretty straightforward so long as you understand Chinese. They have a top five list and we just ordered everything there. If not they have a rudimentary English menu as well. They call these 咸香黑魚子蒸燒賣, which literally means fragrant black roe pork dumplings. These pork dumplings are actually garnished with a few pieces of caviar on top. The extravagance of dim sum these days… I guess if you’re paying HK$19 for 2 pieces of siu mai, you have to expect some luxurious garnishings. The siu mai had a strong fragrance and it was very springy to the bite. We rate this 3.8/5. They call these 師傅冬筍鮮蝦餃, which literally means the master’s bamboo shoot fresh shrimp dumplings. They put bamboo shoot into these shrimp dumplings! Well I must say Lou Dim Dim Sum really tries very hard. These are also priced at HK$19 for 2 pieces. These have the usual fragrant taste that can be found in shrimp dumplings and the skin has the perfect texture. We rate these 3.8/5. These babies were actually rate #5 in their top 5 list! It looks and sounds really novel with a very nice presentation and garnishing, but it tasted exactly like how it sounds. Deep fried glutinous rice balls with sesame and malt filling. It was crispy to the bite with a very hot malt filling and the sesame fragrance. If you like malt this may be a dish for you, but we were not very impressed with it. They cost HK$22 and we rate this 3.5/5. Okay their translation in the English menu is a bit inaccurate. The Chinese words actually translate to fresh small intestines. Yes, it is a rice roll with beancurd and small intestines, not simply ‘meat’. I am actually only finding out about this as I type this article. The rice roll had a good texture and the beancurd was nice and crisp. If you like small intestines, this may be a dish for you. But as with the glutinous rice balls, we weren’t too impressed. They cost HK$26 and we rate this 3.5/5. From looking at these hamburgers you could tell why the place is so highly rated. The chef has spent a large amount of effort creating novel and extravagant dishes, together with some fusion ideas like these mini hamburgers. You would never find them in another Dim Sum restaurant. You can pop one in your mouth, they last at most two bites. The buns were toasted nicely together with the mayonnaise and lettuce on the meat it provided a novel and tasty balance. They cost HK$24 and we rate these 3.8/5. A proper translation of 清酒雲吞雞 would be along the lines of chicken wanton soup with Japanese sake. This was the best item of the night. The chicken wanton was soft and delicious with the perfect skin texture. The soup with the Japanese sake provided a unique and addictive taste, and we cleaned the bowl up. These cost HK$28 and we rate these 4/5. This is just a fancy sounding name for your typical dim sum char siew bao (steamed barbecued pork bun). It arrived piping hot and the pork was well marinated with honey and the usual sweet sauce. Not the most memorable char siew bao. These cost HK$18 and we rate it 3.8/5. Well I’m not too sure about dim sum in Hong Kong. We were eating the best food in Hong Kong over the last few days and at the time Lou Dim Dim Sim seemed quite pedestrian. However we have to commend them on their unique and fusion dishes that were out of the norm. Eateries like these are the reason why our dishes are not identical to the ones that our ancestors ate centuries ago. 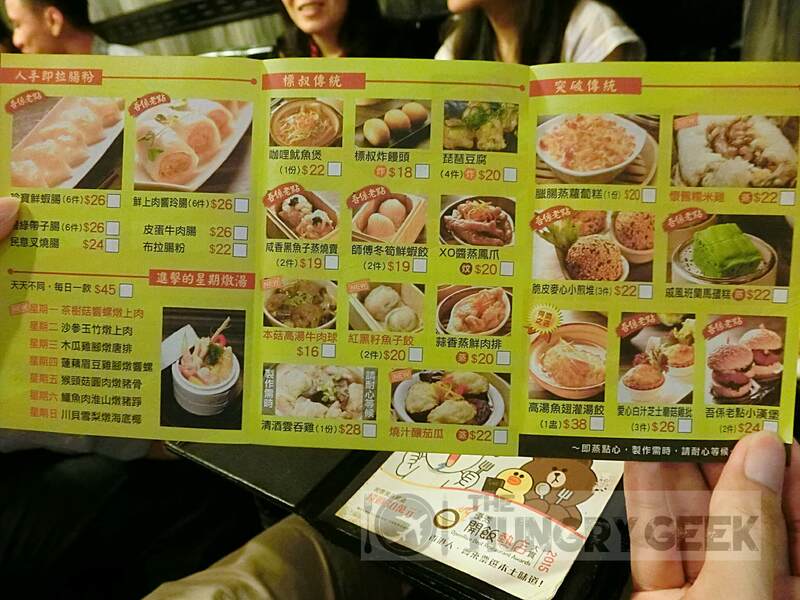 We hope that Lou Dim Dim Sum continues to innovate and refine the tastes of their food items.